Get The Loudest Cheers For Your Team! We are your number 1 supplier for all your inflatable advertising needs. 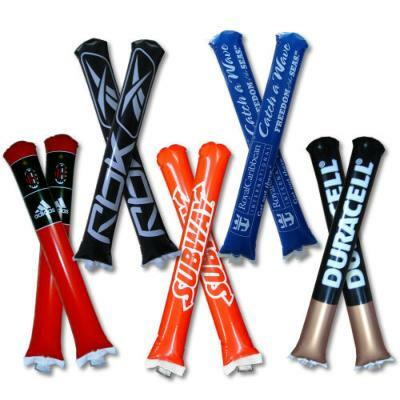 Our PubliStix are similar to products such thundersticks, cheering sticks, bambams, and noisemakers. Custom inflatables are the perfect way to cheer on your favorite sports team by promoting their logo and making a load of noise during the big game! Our products are also used at political rallies, concerts, celebrations, parades, events, direct mail and product launches. Our PubliStix are top quality and due to our volume we can offer you the best pricing. AS LOW AS $0.31 PER SET our prices include set up charges and printing costs. Have a look at the many shapes and options. Is yours not there? We’ll custom make it for you! Any questions? Call or e-mail us and our friendly staff will be happy to assist you. Need More Branded Products For Your Events? Visit Tallman.promo for promotional products, giant inflatables, flags, banners, and more. Tall Man Promo specializes in UNIQUE IDEAS for EPIC EVENTS. Our products come in many shapes, sizes, and variations. It’s a business we’ve been in for over forty years, with combined experiences coming from our North American HQ as well as our international offices. Our products range from small giveaways right up to giant inflatable domes standing over 40 ft wide. Additionally, we also create custom products for when you really want to get noticed for your unique design. So if you’re looking for a creative, striking new way to advertise, please contact us today. Tallman Promotions is your outsourced Marketing department. We offer Marketing & Design services, as well as Promo Gear, Volume Print and Signage solutions. We do our large format printing in-house at our office on Erie Street in Stratford Ontario. We offer installation in and around Stratford as well. So whether your business requires marketing advice, vehicle graphics, stationery, or a new house style, we’d love to talk to you about it. We have a very experienced and motivated that would like to talk. Together, we can create unique event marketing supplies for your company. Check out our drop-down menus to see some of the products we supply. Are you worried about your product? Check out the gallery below to see some of the previous jobs with that product. However, if you do not see what you are looking for, do not hesitate to contact us!